“Hey winter sports connoisseurs of DC! 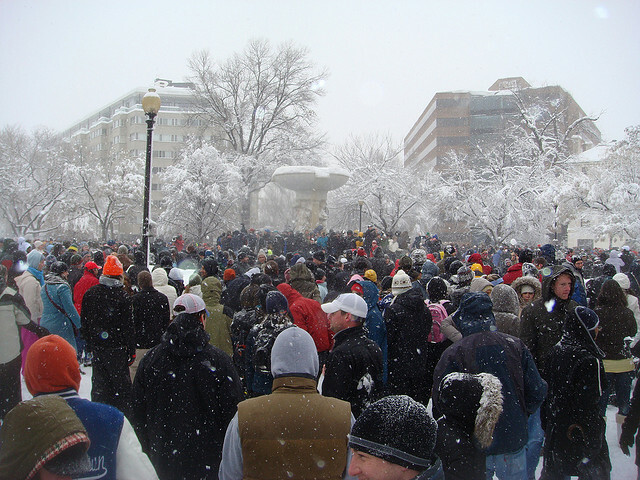 The Washington DC Snowball Fight Association has waited three years for this. A storm that brings enough snow to the District for us to actually have a battle! At 2pm, we had about 2 inches of snow in Downtown, and the Capital Weather Gang is forecasting more to come. We’d love to see you in our favorite snowball arena, Dupont Circle Park, at 6:30pm! By then, a few more inches of snow should have accumulated, and the temperatures should not be too low, so the snow can stick together. Just keep in mind that today won’t be anywhere close to the epic Snowmaggedon battle of 2010. A few things that we’d like to remind everyone who shows up to the showdown! • Respect law enforcement officers and the media – they didn’t get a day off today. • The snowball battle might not be the best place for your pets! • This is meant to be fun! So wear your protective gear, play fair, and follow any instructions given by the Metropolitan Police Department or the U.S. National Park Police. • Anyone who thinks they’re too cool for school (for example, by pelting moving cars) is responsible for the consequences. Safety is important to us!